OK…this is a somewhat controversial but really very fascinating subject. There is a fair bit of reading to do to give yourself a balanced view and you should give consideration to both the following articles before you decide if eating a.muscaria is for you. Contrary to nearly all guide books, this mushroom is edible and tasty with no ill effects – BUT ONLY IF IT IS PROPERLY PREPARED. There is an ongoing cultural prejudice against eating it, as documented in this article which also includes directions for safe preparation. 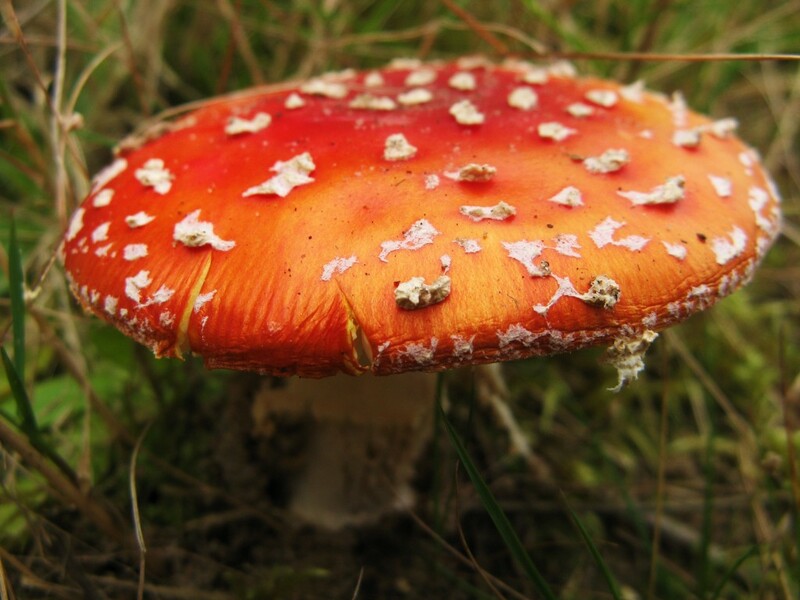 A.muscaria is a potentially VERY POISONOUS (occasionally deadly), only made safe to eat by meticulous preparation and generally not recommended as an edible mushroom. Please read this article which refutes many of the claims made in the article above. You may then also wish to read my further thoughts in response to the second article in the comments section below. To me eating any wild food (or indeed, any food) should be a matter of taking personal responsibility for what you choose to eat. This means doing enough research to feel comfortable in identification and consumption (ie. not just one paper or guidebook – and certainly not just one website!). Personally, I have never deliberately eaten anything new without feeling 100% comfortable about what it is, what it contains (naturally or artificially), and what my own personal tastes and tolerances are. Edibility is not black and white, but culturally and personally defined. “Poisonous” and “Delicious” are not polar opposites, but lie on what I call “The Spectrum of Edibility” – read more about this here: Blog – “The Day I Ate A Deadly Plant: The Spectrum of Edibility“. I am entirely happy to pick, prepare and eat fly agaric as a food – but that doesn’t mean you should feel the same! Anyway, back to the mushroom itself…Eaten raw (or if you drink the post-cooking broth), your body will have to deal with two active compounds. Muscimol act first to cause nausea and stupification – this can be seriously unpleasant, though seldom life-threatening. After that, ibutenic acid acts as a hallucenogen, causing vivid visual disturbances and feelings of hugely exaggerated movements whereby the intoxicated person may take a huge leap to step over a small twig (and feel like they have jumped over a hill). Fly agaric at the button stage. The white covering on top breaks up as the cap grows, becoming the distinctive white spots of mature specimens. These can easily be washed off in wet weather. Extra care should be taken when identifying any immature fungi, particularly if it looks like this. It could look very different a day later! 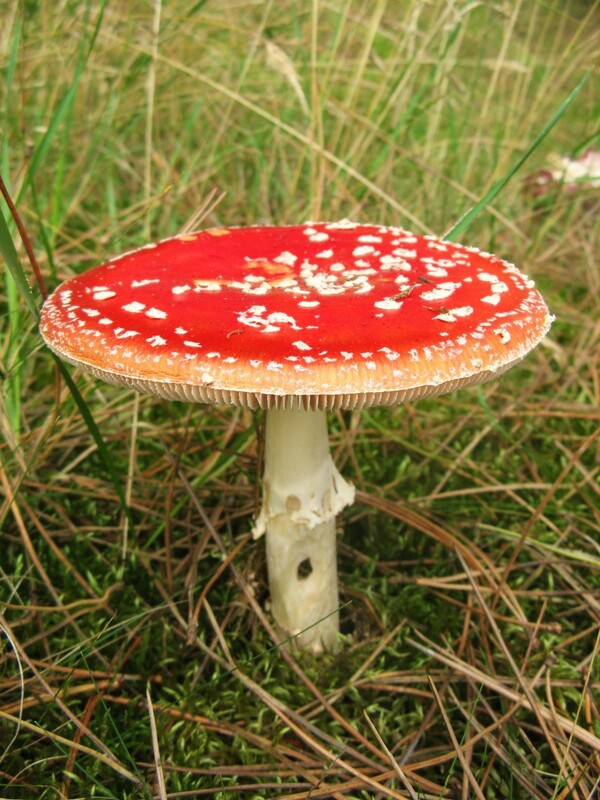 The potency of the active ingredients in fly agaric is hugely dependent on when you pick it. First flush flags (July-August) tend to be much more potent than later ones. Also significant is the stage of growth at which it is picked – generally, the younger and more intense the red, the more potent. And there is also the matter of personal tolerances. 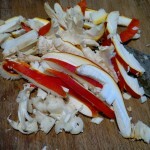 The detoxification process: slice, simmer in salted water, strain and rinse. When we find fly agaric on my guided walks, I generally get 20 minutes off as people chip in their stories of pee drinking, reindeer, berserkers etc. No mushroom captures the imagination quite like the fly agaric! Please leave your tales, myths and experiences in the comments box below and I will assemble a page devoted to them in the future. A very interesting article on fly agaric, these fungi were abundant in Arrans birch woods but i always avoided them when out on fungal forays. I have a field guide advising that L.sulphureus is not edible, and we all know thats nonsense too. 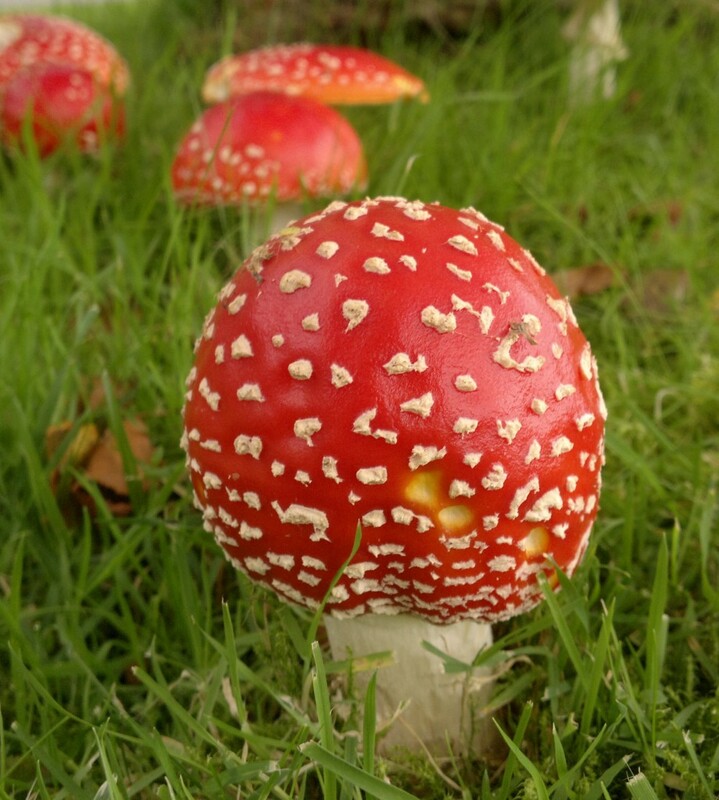 that has caused folks around the world to eschew muscaria as an edible species, except in rare circumstances. Nowhere is muscaria eating common or generally accepted by the fungiphilic majority, either now or in the past. Thanks for this excellent article. I read it with great interest and it certainly diminished my appreciation of the Arora/Rubels paper. Nevertheless, I think I presented the information here in a sensible way which allows readers to make their own minds up on this matter – though I will add some prominence to your article to present a balanced view and outline the shortcomings of the “pro-muscaria eating” paper. I think the more balanced summaries of the edibility of A.muscaria that you detail towards the end of the report are the way forward for listing this species. – I eat a.muscaria a few times per year as food. I personally do not follow the explicit detoxification “recipe” given in the paper. I just use a lot of salted water, a generous (though again, unmeasured) boil time and plenty of rinsing. I do not advocate this approach to people trying it for the first time, but I feel entirely comfortable with this. Were I intending to feed it to others, I would be more meticulous. I like the flavour/texture when seared afterwards, though its certainly not on the top gastronomic tier! – I do not feed it to people on my fungi walks. I think this is something to do for ones self without bravado or peer pressure and with due contemplation – not least for the peace of mind and sense of personal responsibility it fosters. I do, however, regularly graze yew berries with my groups, reminding them to spit out the highly toxic (if unlikely to be broken down by digestion) pips. 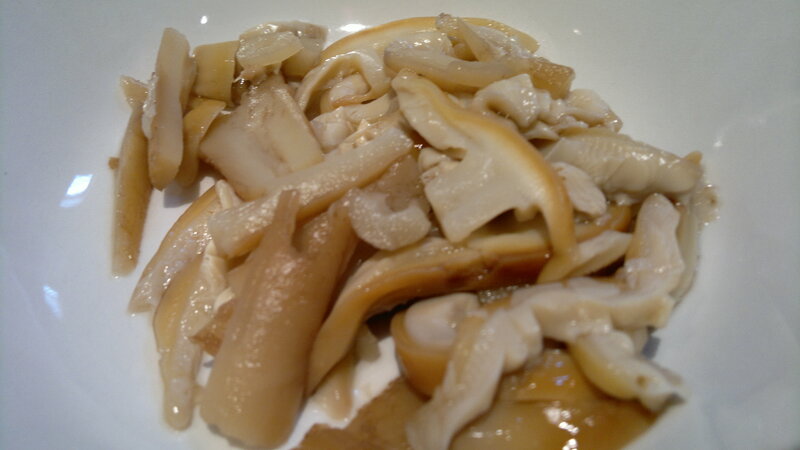 I call it wild food fugu and people enjoy the experience. Its interesting to note that people will easily take to eating yew berry flesh, but very few would consider detoxifying a.muscaria or a.rubescens. Mycophobia is deep set. -A.muscaria is one of our most common mushrooms and pretty much the easiest to identify. This, in an odd way, makes it an excellent “beginners” mushroom. In many ways I think it would be far better for people to mindfully pick and reverentially prepare a.muscaria than rare, over-harvested or “dangerous lookalike” species. – There is certainly a prejudice against giving accurate information on a.muscaria in many guidebooks compared to other fungi that require detoxification. I’m aware that raw a.rubescens doesn’t present the same dangers as a.muscaria, but it should be prepared similarly. ALL my guidebooks list it as edible. See also morchella spp, armillaria spp,and many other fungi – as well as potatoes! – People eat too little of, too much of, badly prepared, under-ripe, over-ripe, undercooked, overcooked or just plain daft things all the time. I think we could choose just about any foodstuff (established or “cutting edge”) and find examples of it making people ill or killing them. – I find about 1 in 200 people have an adverse reaction to eating well-cooked c.cibarius! Thanks again for your illuminating research and please do forward me anything similar in the future. I have eaten Amanita Muscaria for many years my doctors do 3 blood tests for liver function and any other issues that may be present and like I suspected no ill effects . In the early 80s I picked a whole brown paper bag full of giromitra ( false morels )what we called German browns , I ate the whole bag fried with onions upta camp . No mushroom in my opinion should be cooked while covered, I was hospitalized for one night and day , false morels cooked with a cover may make you very ill but I’m still kicking. I would not eat a destroying angel ever . Sam ristrich was involved in studying me for his research at the university. Some folks may be different but I’ve eaten aminita muscaria raw , cooked , and as a tea for years but I don’t drink urin lol . I love hearing stories about fly agaric; reindeer urine drinking, santa clause being a remnant from pagan shamanism, viking berserkers, etc, and as a Norwegian I can add a personal relic to these stories. Lying amongst potluck dinner casserole dishes, Lutheran Bibles, and other wholesome midwestern family heirlooms is a fly agaric candle holder! This is well over 100 years old, who knows if the makers of the object new the significance of the mushroom, or were just using a carried over symbol that lost its true meaning but I do know one thing, if you go back far enough my ancestors were using this mushroom and I have the relic to prove it! Great article, even though this type of mushroom is WAY advanced for a beginner like me, I love learning more about it. BTW I can send a picture if you want. That’s really interesting – i’d love to see a picture of the candle holder. This is such an iconic mushroom that it has pervaded human consciousness in many way – often regardless of it psychoactive nature. The main thing for me is that it is really, really beautiful – and always a delight to stumble across. I appreciate your highlighting some of the ideas presented in my paper for your blog readers. I agree with you that, as individuals, we can choose what risks we want to take, and what we choose to put into our own mouths, for whatever reason. I took exception to Rubel and Arora downplaying the very real dangers of eating muscaria, and their claims that it was commonly eaten or was a widely accepted edible anywhere or at any time. This is simply not true. Yes, one can boil it enough to remove at least most of the toxins; the longer the prep, though, the more likely to remove them all. Try that well-boiled piece, though, and it is not so delicious anymore. Carmelizing anything in butter improves its flavor. Why drop a toxic mushroom into the mix? A number of folks who are experienced mycophagists have had unpleasant poisonings when using a boiling prep, so it is certainly not foolproof, even when the cooks are far from fools. Beginning foragers are well served by initial warnings about any toxic species; let the experimentation come later, with experience. 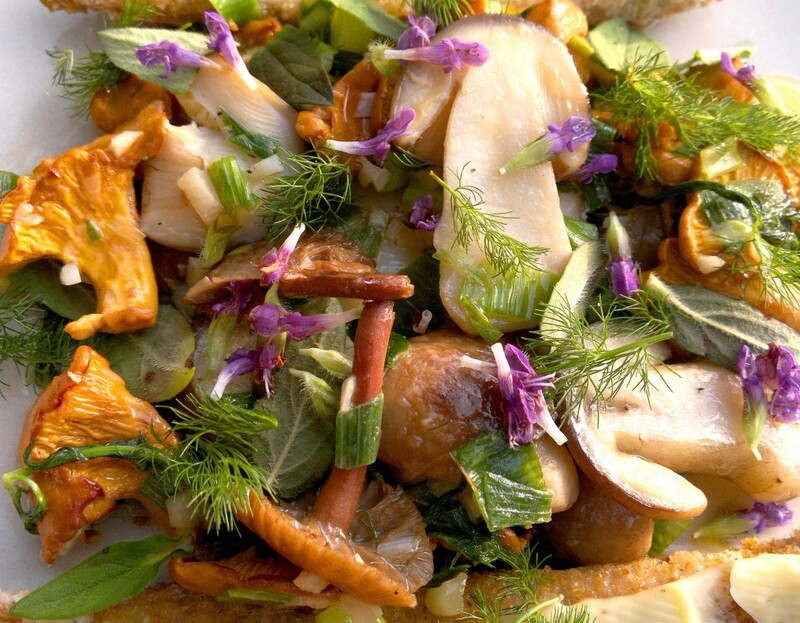 Morels are a poor comparison to muscaria; morels are not toxic once cooked; no special cooking whatsoever is necessary. With “edible” muscaria, there are lots of caveats: thin slices, just enough water, double boilings and don’t forget to throw out that boiling water when you are done! Not quite the same as just throw it in a pan and cook and done. 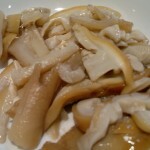 Some folks enjoy that “fugu” experience, and more power to ’em. but that’s a long way from touting muscaria as a safe and unremarkable edible species in any future field guides. As to your UK chef friend serving muscaria to the masses: all toxins are dose dependent. As I stated in my paper, i have eaten muscaria three times: once parboiled and sautéed (yucky), once just grilled (yummy!) and once rehydrated on pizza. Even the unboiled muscaria had zero effect on me, positive or negative, but that doesn’t mean that I would serve it to others, or consider it to be safe. One piece, no matter how prepared, is a meaningless dose, for most. These muscaria tastings are not controlled scientific studies, they are foodie thrill seeking. 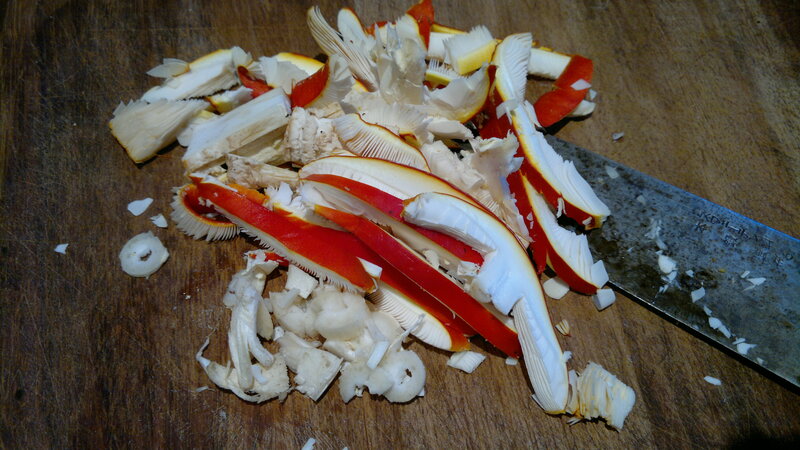 One slice of muscaria is harmless to most, boiled or unboiled; escaping unscathed is hardly news. The danger is when folks take away the idea that muscaria is a harmless mushroom, easy to ID and prepare. If that were so, it wouldn’t be universally shunned by fungiphilic cultures everywhere. Yes, there are small pockets of those who have learned how to prepare it, but they are the exceptions not the rule, and in most cases there are extenuating circumstances (i.e. starvation). The current muscaria fad is something else again. When enough people get poisoned, then that pendulum will swing back the other way. You are absolutely right about the almost universal fascination for this beautiful mushroom, and the very discussion of eating this highly storied mushroom is plenty of thrill for most. This is exactly why I believe that it has been mentioned here and there throughout history: it’s a hot topic. I certainly wouldn’t recommend a toxic mushroom for the table just because most of the time it is easy to identify. Use that knowledge to avoid it for the table, not embrace it. But that’s just common sense. I agree totally with everything you say. 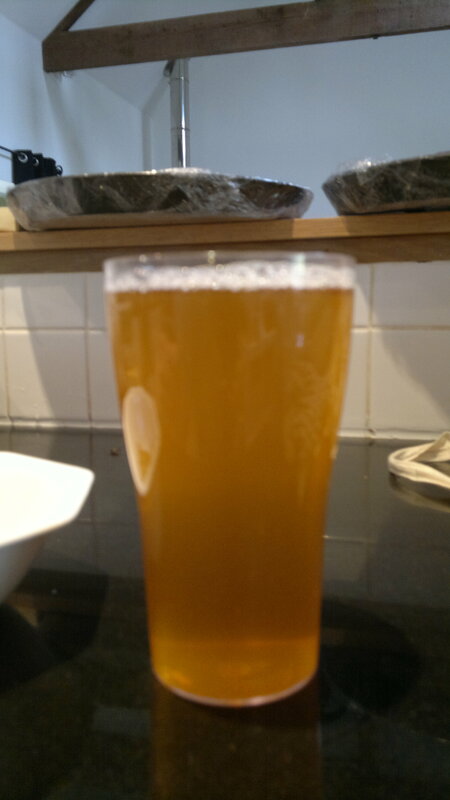 A dear friend of mine was given a tincture made out off fly Amanita muscaria and vodka. She only dabbed it on to her flesh were old scars were. When going to bed she felt fine, then awoke in a psychotic episode that has continued now for 7 weeks. Ibotenic acid poisoning interferes with your Gabba A transmitter pathways. When dabbing it on her skin it went through the most permeable part of her skin straight into the blood and through the blood-brain barrier dear friend is not the same. You may say this is a rare case but Beware! Beware! Be aware. Hi I don’t mean to ask foolish questions but I’ve found a group of these muscaria but they aren’t red they have a yellow cap with a bright red center it has the white spores but it doesn’t match any of the pics. 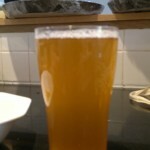 I’ve seen is this still safe to ingest if prepared properly? The colour in a.muscaria is (like the toxins) water-soluble. After wet periods they can often look orange or even yellow. The deeper red centre suggests that this i what has happened. At this stage they are likely to be well past their best for preparing for eating. There is also a yelow form of fly agaric – Amanita muscaria var formosa. 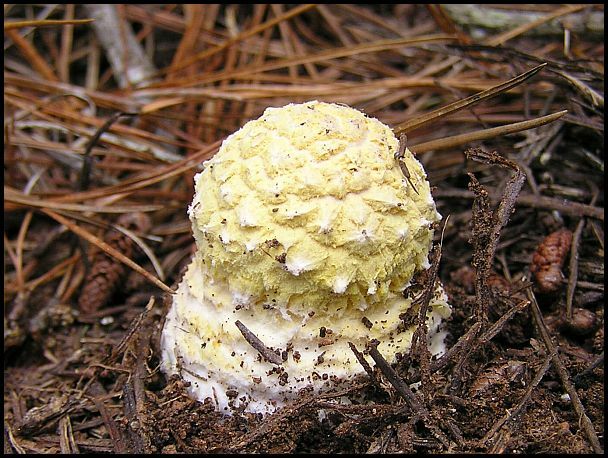 It has a yellow or orange-yellow cap with yellowish warts, and a yellowish stem. Native to N America, not sure if its present in Europe. I am not familiar with it, so would hesitate to give advice. My expectation would be that it can be treated in the same way as its more common relative. south Dakota’s Custer state park. I left them alone for not knowing what they were. I do not see how to attach a photo for conformation. if you email me at mm3ss678@gmail I will send you a couple of of jpeg pics the one I am looking at right is showing 8.87 MB I have 7 photos all ovver 8 Mb for each one. Hi Jackson, if you post them on my FB page i’ll try to have a look. In Led Zepplins “The song remains the same” isn’t this the culprit that sends Jimmy on a wild ride? Do you recommend that? I’ve heard that the film includes a fantasy scene in which he eats some, but not heard any reports that it was responsible for their output! I can’t recommend taking class A drugs on a public forum. Best to read as much information as possible and make an informed decision for yourself. This is a fantastic piece, thanks for writing it. I wasn’t aware of the detoxification process for this mushroom to make it safe to consume, thanks for detailing it out. My son picked and ate them washed peeled sliced and fried in butter with salt and pepper. They smelled delicious. I’m not a great fan of edible mushrooms any way but he ate 3 caps and had no ill effects. Not even a hallucination or purge. He said he would happily eat them again because they had a rich meaty flavour. The place we picked them was in the countryside near Carluke in a small open copice of trees. And the month was September. He has also eaten yew berries in the way described above. I would be more wary of yew berries than amanita muscaria. That’s interesting Anne, but not something i’d recommend. The toxins are water soluble, but need rinsed away. Cooking alone is not guaranteed to break it down. Wow I need to get out more, I have only seen this type in books and cartoons and just assumed it was a myth like unicorns or leprechauns – I’m amazed that these spotted red things actually do exist!